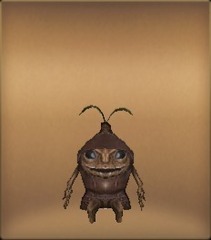 A newly born Mandragora of the Armoured subspecies. Other variants are being discovered one after another in Lestania. This tough and resilient specimen has fashioned its garb from discarded materials. It is also believed that there are many variations of this armoured subspecies.